A “tent in the park”: the new Design Museum sits in the former Commonwealth Institute building from 1962. At the press view for the new Design Museum in London last Thursday, you needed to pass through the lofty entrance atrium and down to the basement auditorium before laying eyes on any sign of a design classic – and indeed a first vivid splash of colour – in the person of the original Museum’s founder, the designer and restaurateur Sir Terence Conran, now 85, wearing a vivid French-blue shirt, who was participating in the opening speeches. For the interior of the Museum has been designed by the arch-minimalist architect John Pawson. So its dramatic entrance space rises completely bare of exhibits, in a series of simple blond wood and white plaster terraces. It resembles a bleached stair-well, its stark orthogonal lines animated by – and silhouetting – the figures of visitors who contrasted strongly with the swooping grey concrete ceiling above. 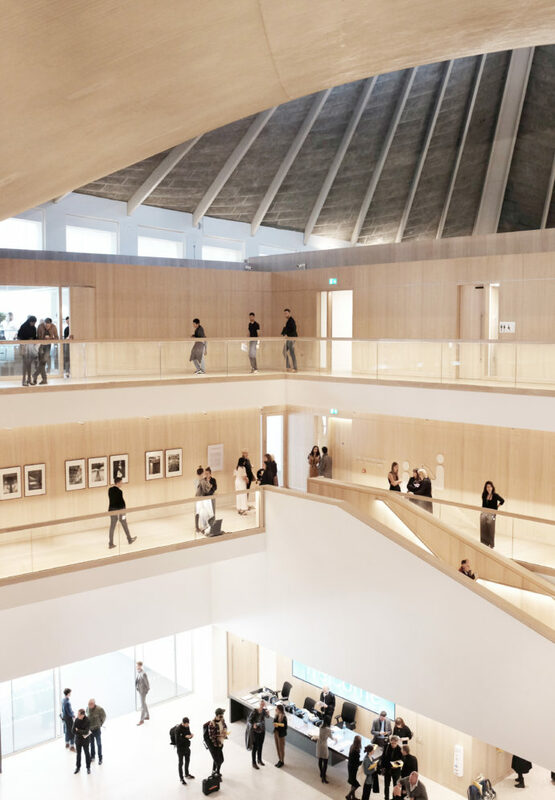 The entrance and interior of the museum were designed by John Pawson, known for his minimalist aesthetics. 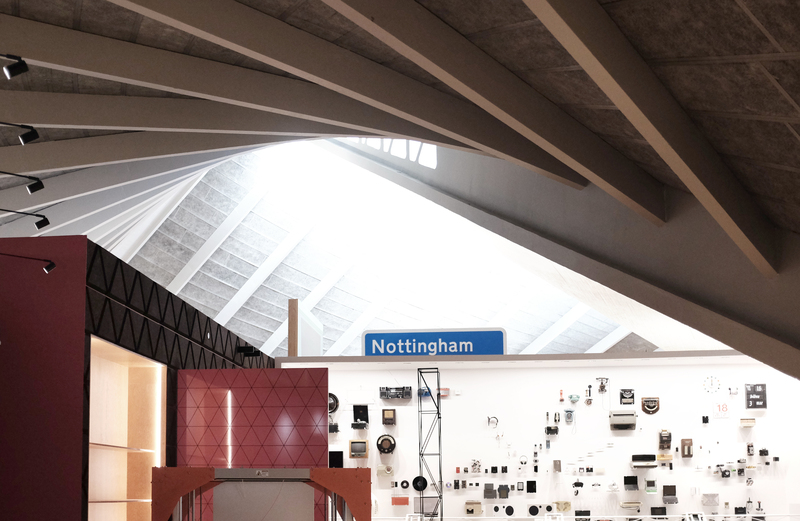 This ceiling is the underbelly of the hyperbolic paraboloid copper roof which dates from the Commonwealth Institute building from 1962 that stood empty for over a decade and has now undergone a five-year renovation by OMA (Rotterdam). 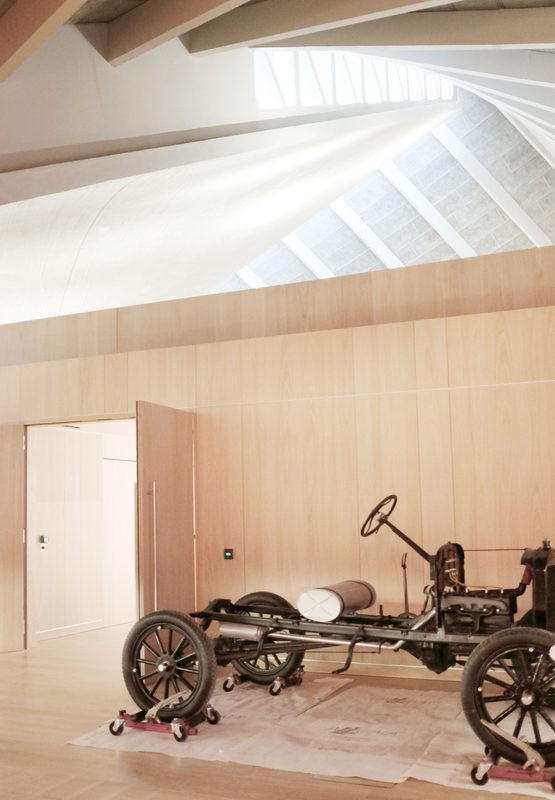 The distinctive shape of the roof was originally intended by its architect Robert Matthews to resemble ‘a tent in the park’ and it is essentially the sole remaining element of the original building. 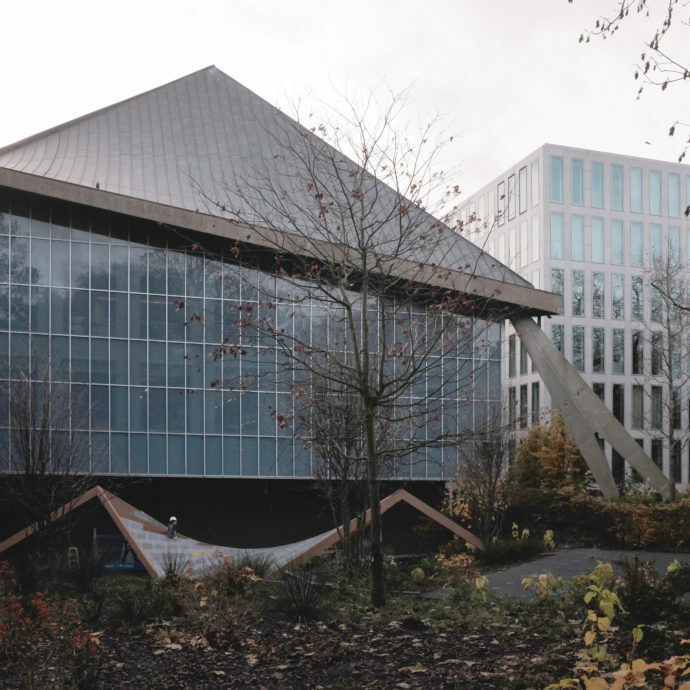 For as Reinier de Graaf of OMA has described it: “a conservation became a restoration, and ended up being a replica” with the whole building, bar the roof, needing essentially to be rebuilt for structural and environmental reasons. One symptom of this is that the 1960s glazed façades have been replaced by energy-efficient fritted versions designed to ‘resemble’ the original – this has resulted in a slightly zombie-like look to the exterior. To finance the project, the planners had to compromise on the original garden setting, too. 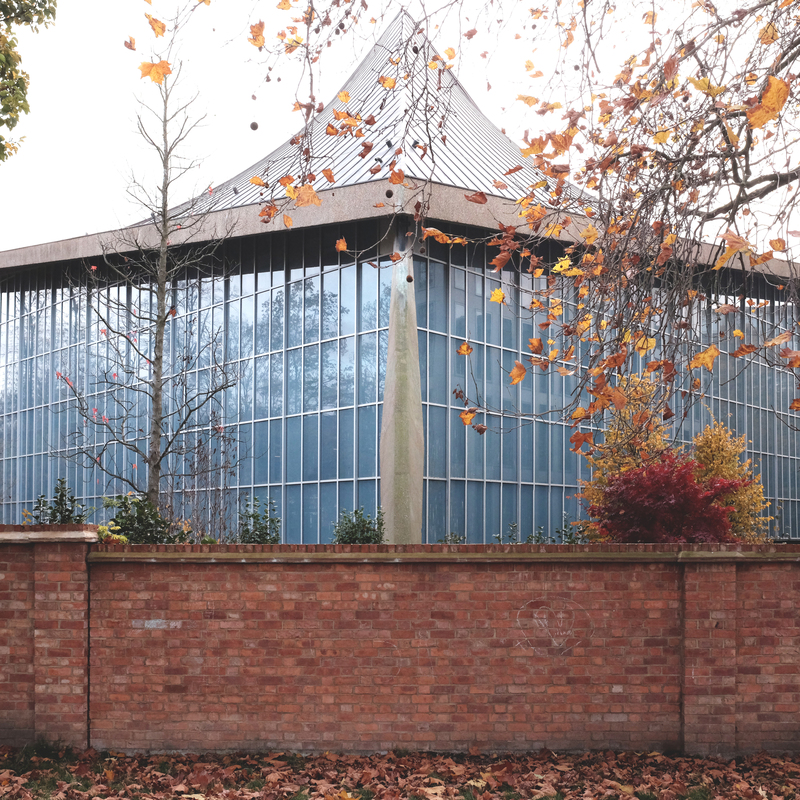 In a typical London development trade-off, the £83 million cost of the building (as well as a 175-year lease at a peppercorn rent) has been leveraged by the Museum itself being judged as constituting a ‘public benefit’ – thus allowing the developer to max-out the profit from the rest of the site. So three gridded large white stone-clad hulks of super-luxury housing, also designed by OMA now jostle around the Museum. Indeed you have to pass under the corner of one of the blocks in order to access the Museum’s main entrance. Meanwhile banks of shrubbery designed by West 8 corral the small public space in front of it, dividing it from the private realm of the nouveau riche around it. The ‘tent in the park’ has now become one pitched in a very overcrowded campsite. The roof is essentially the sole remaining element of the original building. All original façades were replaced by energy-efficient versions designed to ‘resemble’ the original. 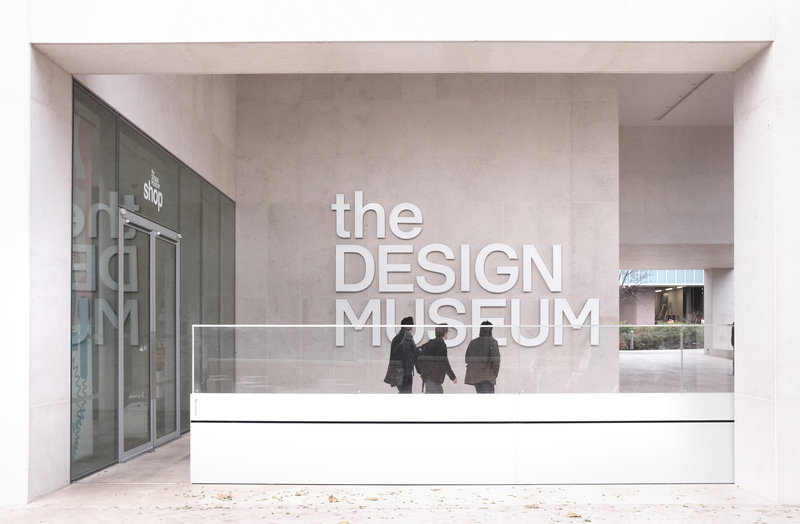 All compromises aside, this ten-year project is still a tribute to the vision and persistence of Sir Terence and the Museum’s Director Deyan Sudjic. Their tenacity has resulted in the museum’s size being expanded to 10,000 square metres, almost three times as much as it had at its previous site at Shad Thames. There are now three galleries: one for the permanent collection and two for temporary exhibitions, a 200-seat auditorium, studios for ‘designers in residence’, a library, archive and capacious new learning facilities. Little of these extensive new facilities is evident in the lofty, muffled calm of Pawson’s atrium though. He himself compares its space to that of an ‘open-cast mine’, a strangely miscast metaphor given its pristine finishes, elegance or even blandness. For the success of Pawson’s brand of minimalism has seen it become the ubiquitous preferred style for high-end fit-outs over the last 20 years – from offices to shops to apartments – so it does not surprise anymore. The space definitely has it’s wow factor, but it’s a muted wow. 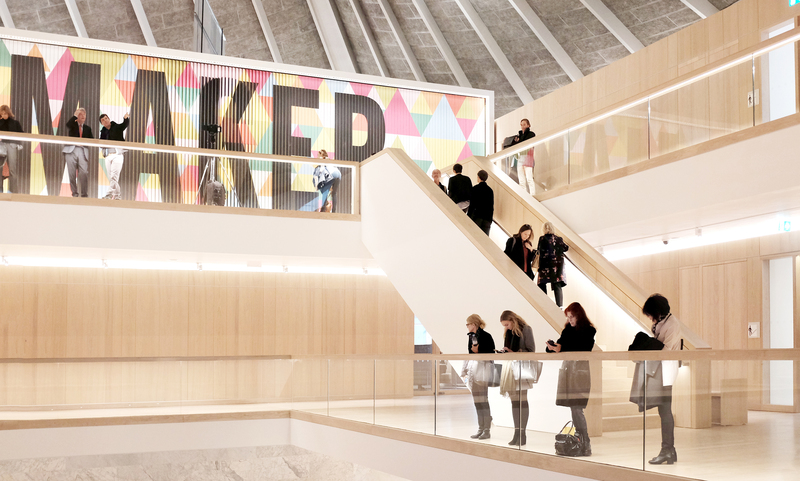 As with so many other museum and art spaces today – for example, the glorified staircase that is the new Tate Modern extension – this is not about exhibit-looking but people-watching; about circulating, seeing and being seen, the architecture is not about getting you from A to B but forms a dramatic backdrop to selfies. 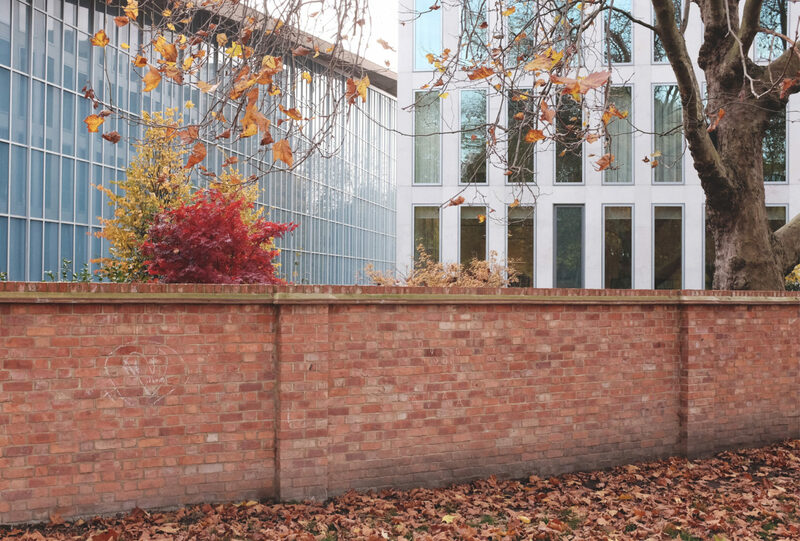 It‘s most of all the visitors who bring colour and movement into the lofty calm of John Pawson‘s atrium. 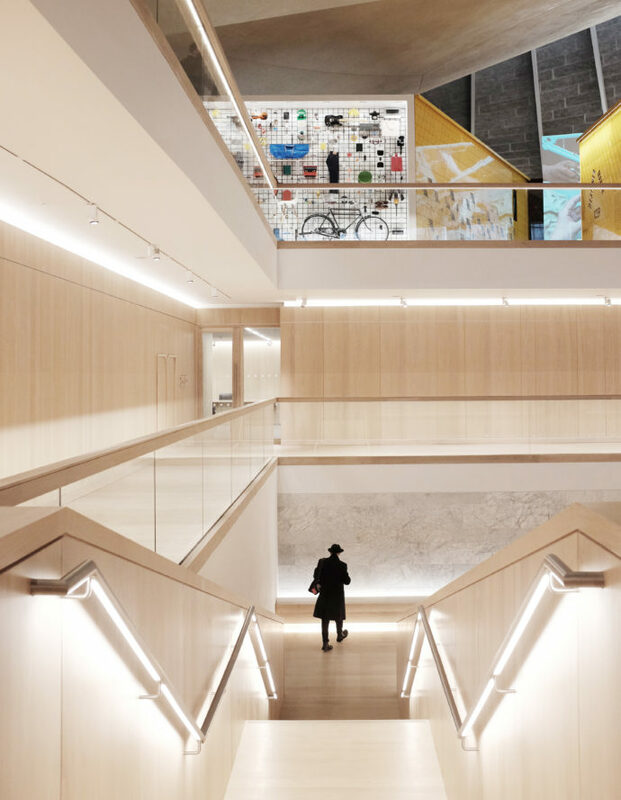 Only when you do finally circulate up to the top floor, will you find a satisfyingly object-stuffed space: the permanent display of the Museum’s collection. It ranges from the big (a full-sized ‘gerberette’ steel element from the Centre Pompidou in Paris, a 1:1 prototype for a new tube train, and a huge motorway sign) to the to-be-expected classics (Thonet chairs, Dieter Rams’ Braun products and Margarethe Schütte-Lihotzky’s Frankfurt kitchen) to the lethal (an AK47 gun) and - finally - the once edgy (early punk pieces by Vivienne Westwood). 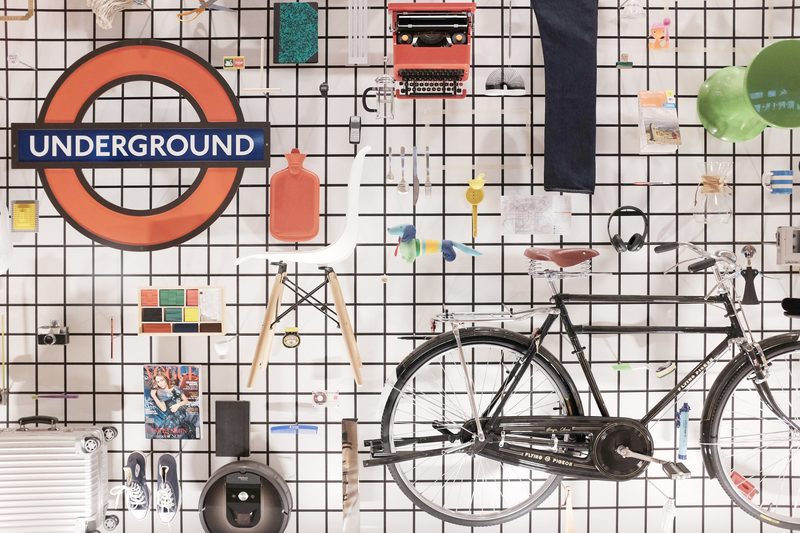 crowd-sourced objects, chosen by the public as their favorite examples of design. 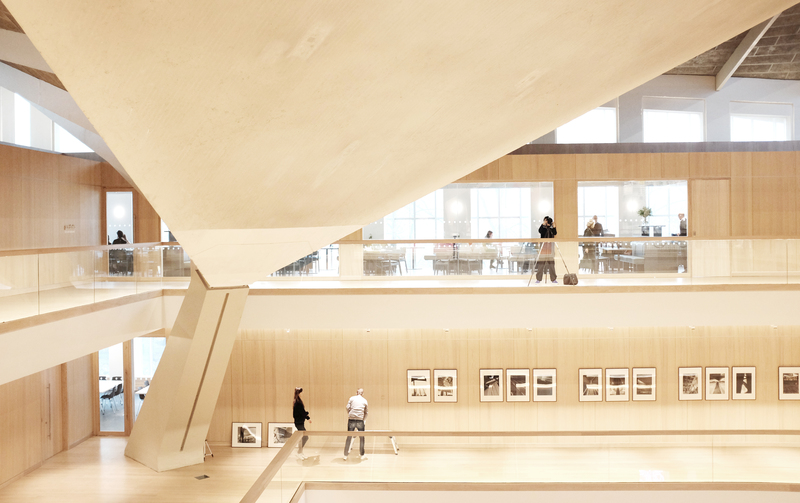 High above the atrium, the swooping concrete ceiling draws attention. The vast collection of the museum offers bits and pieces of the entire design history. 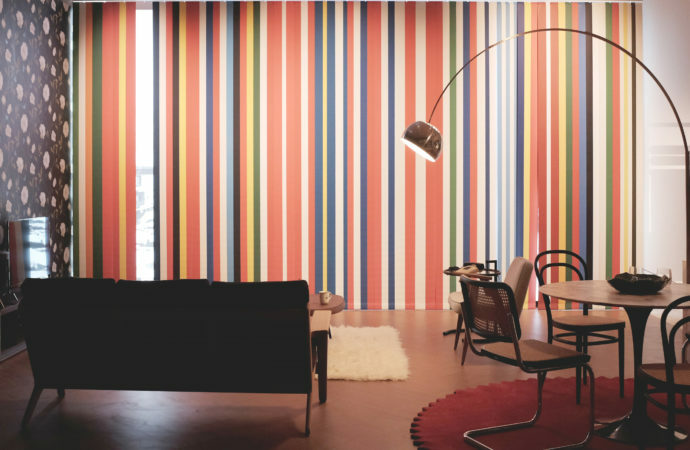 If this exhibition represents ‘design past’, the annual Beazely Designs of the Year exhibition in the spacious basement gallery – from the David Bowie Blackstar album cover to the Pezo von Ellrichshausen’s Nida House in Chile – is ‘design present’. While the most thought-provoking show “Fear and Love – reactions to a complex world”, created by the Museum’s Chief Curator, Justin McGuirk, looks more at how the shifting threads of design intertwine with social and technological change. This again is a display, as its introductory paragraph states, about ‘contexts not objects’ of a ‘way of understanding the world’. To give you just a brief idea of how far this exhibition reaches, Spanish architect Andrés Jaques has explored the use of gay dating and sexual hook up app Grindr, and its effect on lives and behavior, not only in the context of the big city, but also in how it has provided an alternative network of support and liberation for young gay refugees. Meanwhile a full-sized industrial robot, programmed with custom software by designer Madeline Gannon to do nothing more than react to movement around it, gently suggests a possible shifting of boundaries of human/machine interaction and empathy. Elsewhere the change in older relationships and their reflection in design is explored by Rural Urban Framework looking at how the nomads of Mongolia are adjusting their traditional yurts to a more settled urban life. 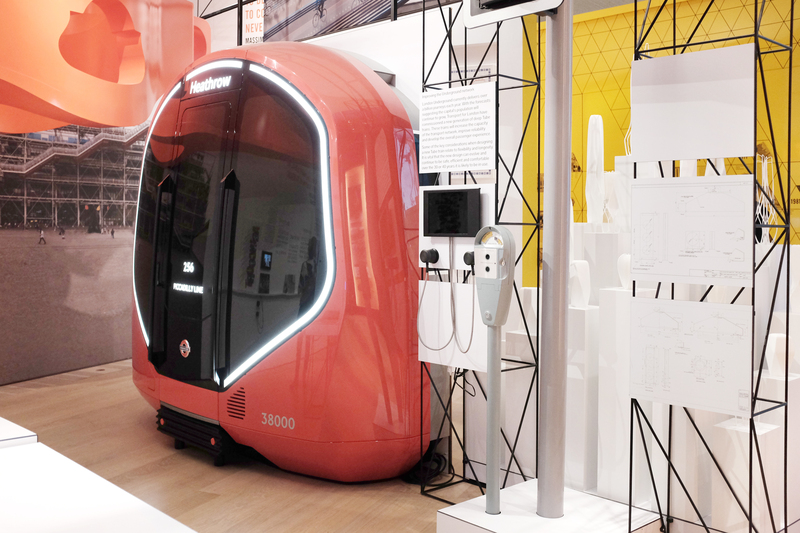 Protoype for a new tube train. Some expected classics like the London tube signage. The room-set by OMA features their EU barcode flag. Design is about optimism, Sir Conrad said at the opening. Is it? The most old-school-looking exhibit is the room-set by OMA, made up of 28 domestic design objects and products, one from each member state of the EU – a display that the practice completely redesigned following the Brexit vote on June 23. As a backdrop there is a hanging curtain formed of the OMA-designed EU Flag – a polychrome barcode made up of all the colors of the EU member states’ flags. It swivels ocassionally to reveal a black-and-white photo of Rotterdam laid waste by fire bombing. Not subtle but a direct way to connect design and aesthetics to wider cultural and political identity and issues. 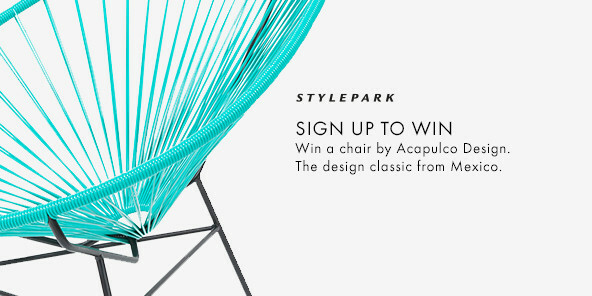 The canvas of design presented here is unbound by stuffy old disciplinary walls – this is design seeming to have its cake and eating it – represented by both visually stunning instagrammable objects, while able to comment more on psychological, anthropological, and sociological processes than just form following function. Still one can’t help missing the simple certainties of design as a solution rather than just as a narration of a problem. Similarly with the building, which itself in its complicated genesis and with an interior bearing little connection to the exterior, seems to be more a symptom of a condition rather than a solution – and not least, the condition of the UK and how it sees itself in the world. For a building once built to celebrate Commonwealth trade and the old links of Empire has now been repurposed to celebrate Britain as a hub of the creative industries and “design’s importance to the citizens of this country and to our economy and especially manufacturers” as Sir Terence put it in his opening speech, which was difficult to hear without placing a Brexit filter across it. 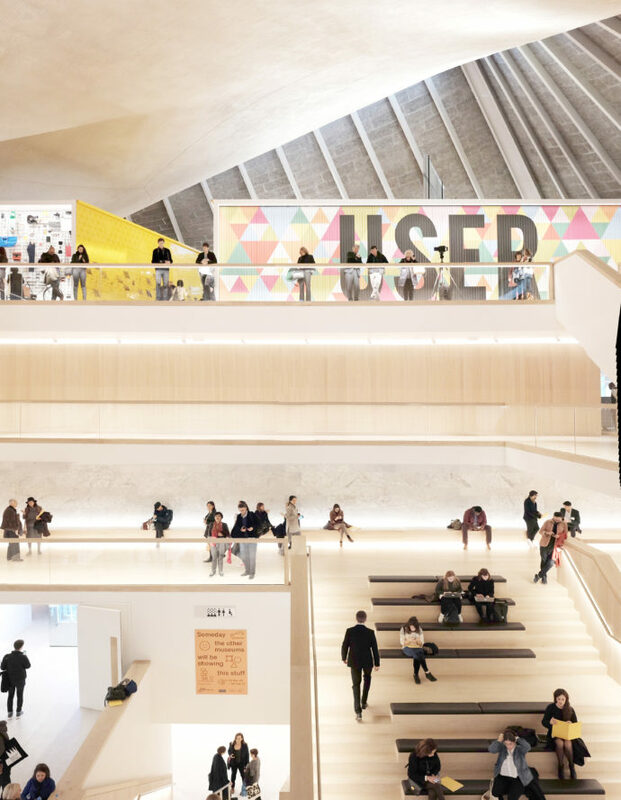 For if, as he said, “design is about optimism,” the new Design Museum seems to be couching this optimism in slightly guarded terms. The brightly lit central staircase. A staircase that doubles as auditorium. The direct neighbours: three stone-clad hulks of super-luxury housing, also designed by OMA.